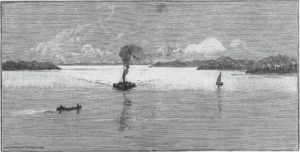 ‘The Agnes steaming up the Pungwe River’. The Bents left poor Beira on the S.S. Norseman around 24th November 1891, for their home journey south and onwards to Cape Town and London. The illustration is ‘The Agnes steaming up the Pungwe River’. From a sketch by ‘Mr. Doyle Glanville’. ‘The Illustrated London News’, 15 August 1891, page 202. Private collection.